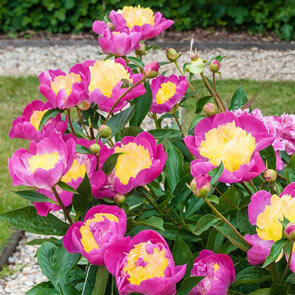 A modern twist on the traditional peony! Flower Color Fuchsine rose petals, staminodes pale lemon yellow . Flower Form Very large, 10-12" flowers have pink guard petals and a mound of pale Lemon yellow staminodes in the middle. Japanese style flowers. Foliage Type Glossy mid green foliage.